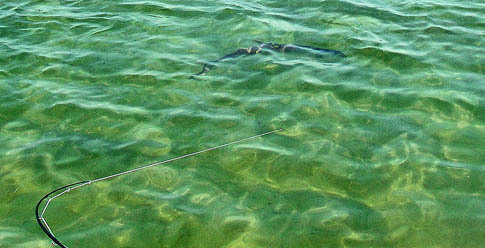 It is tarpon season here in the Florida Keys!! The weather has been perfect.. Very light winds from the south east and sunny.. Water temperaturures remain in the 80's and the fish are here.. Still lots of tarpon in the back country and some nice schools have started marching on the ocean side also..
Two days ago I fished with Doug from Oregon.. He hooked two dandy tarpon on a green toad fly.. I have not looked in several days, but have heard reports of some good numbers of permit on the gulf edge.. I have had a couple of days open up in May.. May 19, 25 and 26..